I absolutely love Cloud Fabrics. In fact, I am thrilled that the 2017 Quilter’s Planner will be featuring a full Cirrus Solids Color Card in the reference section, making it easy for you to choose the solids you need for your next quilt! (If you haven’t bought your planner yet, this is definitely the month to do it)! Cloud9 Fabric is high quality, organic, vibrant, fresh, and easily available for customers. You can buy Cloud9 at many local quilt shops around the country, online, and at Joanne’s! The blocks will all be shared starting two weeks today (Monday, September 12th). We have almost 70 participants in this hop and they will each be presenting a tutorial for a new 12″ (finished) block using 5 fat quarters of Cirrus Solids generously donated by Cloud9. I’m so excited about this color palette. We curated the “Berry Harvest” palette for the quilters to design their blocks with. Be sure to check in at each of the hosts’ blog posts each day for the whole list of blog participants. All of the quilt blocks featured are going to be collected and assembled into charity quilts. On another update note, I am happy to announce that Tips and Tutorials Tuesday will be coming back bigger and better than ever! 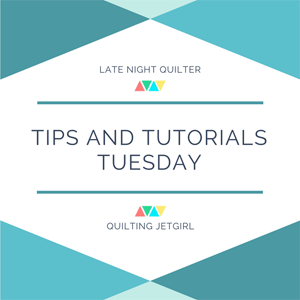 My good friend Yvonne, from Quilting Jetgirl is coming to the rescue and helping me revive the Tuesday feature. I’ve always loved the idea of Tips and Tutorials Tuesday. I love sharing tutorials for my favorite techniques, and I love seeing all the other tutorials posted by the other bloggers in our community. But with my kiddos (4 kids means too many extra curricular activities to count on one hand), my job traveling and teaching for Handi Quilter, and the design and launch of 2017 The Quilter’s Planner, the weekly commitment was all a little more than I could handle. And starting in 2017 we will ramp up to hosting every week! So dust off your thinking caps, look at your schedule, and let’s make a plan to write up some helpful tip or tutorial posts and share them. I can’t wait to get started with the Tips and Tutorials Tuesday link party on October 4th, I hope you join us! My Top Project for 2016: Tribal Blocks by 13 Spools! I really love all of the colors in the “Berry Harvest” palette! Those are my colors. I am looking forward to this block hop with all the tutorials. I am so excited about the upcoming blog hop and that we are going to be bringing Tips and Tutorials Tuesday back to the community. It is always nice to get to work with you! I was happy to hear about your collaboration with Yvonne to bring back the tips and tutorials link-up. I really like the Cloud9 fabrics, in fact, those and the Kona solids are the only fabrics that I will buy at JoAnn’s. I so wish I could have participated in the Cloud9 blog hop but I didn’t want to overcommit myself and decided to watch from the sidelines. Looking forward to seeing what everyone creates. So excited about the Blog Hop next week. I really enjoy working with the Cloud 9 Fabrics.